You probably know that the Photos app on Mac and IOS has a feature where we can name people(s) in individual photos and then those people will be grouped together and added to the default People Album in the app. Sort of like keywording, but using the person’s name instead. In addition to us naming people ourselves, Photos app uses its own algorithms to identify people and that helps quite a bit in moving the naming process along. For example, Photos app would try and find all the photos that have pictures of Uncle Ralph and then offer to add Uncle Ralph’s name to each and add those photos to the ones I had also named with Uncle Ralph. It’s not perfect but definitely better than having to sort through each of my 15000 photos trying to name all my friends and family members individually. Prior to the release of High Sierra and IOS 11, it was necessary to name people on each computer or IOS device separately. There was no syncing of peoples names between devices sharing the same iCloud account. But now with Apples latest software updates syncing is available so that if you name someone on your mac, that name syncs over to any other device or Mac using the same iCloud account. So if you wanted to see all the pictures of Uncle Ralph, you could go to the Peoples album and click on the image of Uncle Ralph, and voila, all the photos where you identified Uncle Ralph appear grouped together on each device you own. Very handy. In my case, over the past couple years I have been haphazardly naming people in Photos on each of my computers and IOS devices, none of which synced, which left me with 4 separate People albums with a lot of inconsistent naming. Now with the advent of iCloud syncing, what I wanted to do is start over…wipe out all the names of people I had previously entered and then begin again on my iMac, knowing that all those newly identified people would also sync to my MacBook, iPhone, and iPad. So what’s the problem to be solved? Everything I read in Apple help or on the internet described how to rename one person at a time. As I have over 15000 photos, that would take me forever to go to each photo, delete any names previously entered by me or by Apple, and then add the names again. Photos app does have a function where you can merge two or more incorrectly named people to reduce the clutter, but even that would take forever trying to find all the inconsistent naming data and then merging them together for each person. What I needed was a Reset All button that would clear all the names I had previously entered. But after asking around and checking the interwebs, I could not find any way to do that. Then I got lucky. 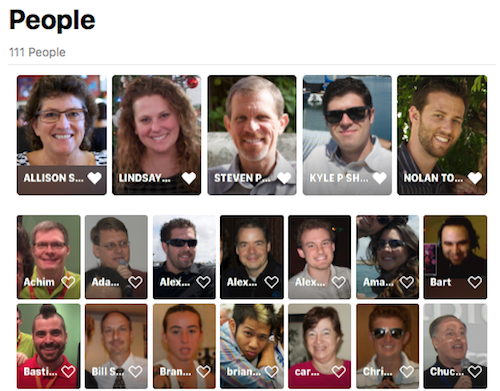 I was on my iMac and clicked on the People album in the left sidebar. Up popped the usual garbled mess of images and names resulting from all my prior naming efforts. In a fit of frustration, I selected all the photos in the People album, (not all the photos in my main photo library) and hit the Delete button. Much to my surprise, it didn’t delete anything. Instead, it offered to reset all the names in my People album that I had previously entered. Exactly what I was looking for. After making a backup of my current Photo Library, I clicked delete and all the names I had entered disappeared, and Photos started reindexing all my photos, searching for names to apply. Again, exactly what I wanted. It’s now been 3 days since I reset, and all my devices are still “updating” with the cloud, but slowly but surely I’ve been able to rebuild my People album exactly the way I wanted it, all synced across all my devices. Amen and Hallelujah! So if you want to start over naming people in your People album, this is the way to do it. One word of caution, it is a fair amount of work to rename everyone all over again, even with the help of Apple’s algorithms so make sure you are willing to put in the effort. For me, ending up with a clean, manageable and searchable People album synced across all my devices was definitely worth the effort. I suppose you could also have merged the various versions of “Uncle Ralph”? Edgar – Rick’s problem was he had more than two of every person so it would have been very labor intensive. Easier to start over if he could. Yes. I started merging but I would have had to spend almost as much time doing that as starting from scratch. Gotcha. As a follow up, do you know what the bottom bar is under the first picture of Allison S? I have that on one of mine and have not figured what it’s trying to tell me? Edgar Is it possible it’s there because it matches the Vcard I have identified as me? Hi. I have upgraded to IOS 11 on my iPhone 7 and my iPad. I have upgraded to High Sierra on my Mac. While my phone and iPad seem to have synced to each other, they have not synced with my Mac. Any clue how to force this? One reason I want my mac to sync with my phone and iPad is that I want the pictures on my mac (back of bride, profile, back of basketball player) to be put into the correct people groupings on my phone and iPad. I would even go so far as to do your solution of deleting all if I thought it would sync everything to my devices. Thanks for any help. since last week this iOS 11 has drive me mad. First, the photos in camera roll somehow not sorted chronologically. been resetting and restoring the phone with no luck. And now i notice the person album has messed up too. Somehow my first and second daughters photos are mixed up as one person. Been trying to selecting it one by one and mark “not this person” somehow get messed up again and again. I’m tired. I removed them but somehow iOS still recognise them whenever i tried to re-enter their names (and got it mixed up again). So here i am, trying to reset all. However, when i select all person and choose remove, it does nothing. It just gives me warning that the action will reset and remove person face information, but nothing happen after that. Reimon, the feature I discovered about resetting the People album was found using High Sierra, so maybe you have to update first. But it sounds like you got the same dialogue box warning that I did and when I clicked reset it deleted all the thumbnail images in the People album and I was able to start over adding them back in so not sure what’s up with yours. If you can upgrade to High Sierra at some point, that may do it for you. Sharon, only thing I can think of is maybe your Mac is signed in to a different iCloud account than your iOS devices? Edgar and Allison, I also got the black bar under several images but then it eventually went away. My guess is that it indicated that Photos found additional Faces to confirm for that person but as it went away, didn’t bother to figure out why. Rick, thank you so much for this!!! Pictures for me and my wife were merged into our son somehow. I went in and cleared the names, I marked them as not this person, then a day later they were back in under any sons name. Its been super annoying, Photos is now reindexing my images. Is there any way that you know of to rid the people album all together? I am extremely unpopular with no friends and prefer this iPad stop adding faces to the people album without my saying to do so. Does that make sense? Please help, as it’s driving me bonkers! This is a lifesaver! I’m so pissed that Apple doesn’t make this more clear. I’m glad you stumbled upon it so that the rest of us can reap the benefits of your discovery. This is a crucial feature that needs to be more obvious and accessible. I merged my uncle and me and like Dan and many other commenters have said, despite unmerging my Uncle from me, Photos kept thinking it new better than I did and merged them back. I understand that’s the benefit and downside of having AI figure out who people are after you make a selection and it’s only doing what I originally requested, but there should be a more clear way to tell the AI that you made a mistake without having to redo the entire process. Hopefully this doesn’t happen again. I will be much more careful now and hope that until Apple enhances the ability to adjust the settings in this, that that will do. I preferred the old “faces” program so much more! It gave you better opportunities to name people, and it searched for more of that one person so much better. I keep asking the program to find more pictures of certain people, and it will show maybe – 10. Then I go looking and find hundreds of that person! The older version was much more intuitive looking for matches….. Thanks so much for this advice. I have been looking for ages a way to reset the People album on iOS 11 after the system merged the photos of my two kids as one person. I managed to reset the People album also on iOS 11 Photos app by selecting all the persons in the People album and deleting them. Now the device started the identification process over. I just wish there was a way to delete or at least hide people & places from the photo app. I don’t want to use the albums Apple created, I’d much rather just create my own custom albums & use those. I also really hate that it keeps constantly adding photos to the people album from the camera roll without my consent. The software in this photo app seems to have a hard time telling the difference between downloaded photos from the web & actual photos of people taken by the camera itself. This is an issue with IOS 11.4.1 photo app I really hope they address & fix in a future update. Apple please fix this issue. Regarding this Photos app: Where is a Users Manual which should describe all of these options? Woot! I was having a similar problem, and this seems like just what I need. > Tom: Pathetic is right. I was trawling through support documents and could find nothing. THANK YOU !!!! I need this, because I hit de ok button like 20 times thinkings it was the opposite, and a los of people merge with each other. It was a mess. Thanks. Ohhh, the humanity! DELETE ALL THE NAMES when all I want is to d-e-l-e-t-e ME! Somehow, “I” got screwed up. Now, my IMAGE doesn’t even show up in the gallery universe of PEOPLE anymore, but when I look at the TAGS of pictures CONTAINING ME (via the INFO icon), it still shows a circular shot of MY HEAD (along with other faces in the picture) and when I click on that image of ME in the INFO panel – it circle MY HEAD (in the actual picture) and has labelled underneath MY FACE in the actual picture as “unnamed” !!??!! ARGGGG!!!!!! a bit late to this party – but has anyone done this, but then the rescan jumping way far ahead [for me: it jumps straight to 18k photos scanned; plug phone in and lock screen to finish scanning the remaining 18 photos’ but then it finishes and i only have like 10 people show up ready to be named again. all the faces are recognized as faces when i go to photos but they are unnamed, so there’s no way for me to go about naming htem again except click through picture by picture. on my macbook pro – it doesn’t jump ahead to the end of my pictures on the re-scan, but nevertheless it finishes the scan and just those same 10 or so faces show up in the people section of photos. i assume this isn’t intended behavior, and that instead it’s supposed to re scan and i’m supposed to get a million unnamed faces showing up in the peoples album like i did the very first time i upgraded to whatever OS it was in which faces were revamped into people? and if it’s not, any suggestions what to try next shy of exporting and reimporting into a clean library all of my photos? have tried repairing hte library as well and that didn’t make a difference either. I have an issue where someone who was previously identified (and shows up with large album doing search) does not show up when I look at People in the library. In other words, He is not listed. This is my son and I’ve got hundreds (thousands) of photos where he is identified. I wanted to mark him as a favorite and he doesn’t appear in People (under Library). Any way to fix this? Hey Debbie – maybe someone here will knows but you might want to post the question to Apple’s support forums for Photos too. Why is there a shadowed border on Allison’s name, but not on any other name? I’ve seen that in my People view, and it mysteriously appears and disappears.